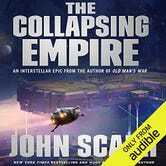 The Collapsing Empire by John Scalzi was one of the most highly anticipated sci-fi novels of 2017, and it’s currently one of Amazon’s top sellers. Download the audiobook version (narrated by Wil Wheaton!) for just $3 today on Amazon. We kick off the weekend with sateen sheet Gold Box, Bluetooth headphones, iPhone cases and more!